The Phillies (and MLB) have an attendance problem — so where did everybody go? 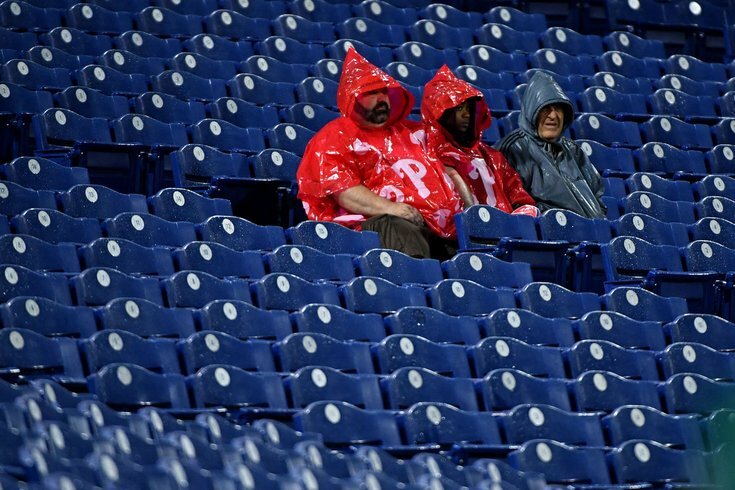 A trio of Phillies fans sit in the rain during an April game against the Diamondbacks at Citizens Bank Park. It’s been unavoidable. Watch a Phillies home game this season and in the backdrop of the pitcher is a sea of empty blue seats. It is confounding, considering the Phillies are relevant in July for the first time in seven years—when the Phils last made the playoffs finishing with their best regular-season record in franchise history, going 102-60. For some reason, this team is not turning the turnstiles this season. At least not yet. Citizens Bank Park is still one of the prime destinations in Major League Baseball. The Phillies themselves offer a fan-friendly environment, and this seems to be a young, dynamic team that is the surprise of the majors at 47-37, a single game behind the Atlanta Braves in the National League East, with a polarizing, though intriguing, manager in Gabe Kapler. Through 46 home dates, the Phillies are 18th in MLB in attendance, drawing 1,230,020 total fans, and an average of 26,739 per game. Though, it’s actually a figure that’s misleading. Without the New York Yankees visiting the Phillies from June 25-27, they would be in the negative in overall attendance and average attendance per game in comparison to last year’s 66-96 team, believe it or not. Prior to the Yankees series, the Phillies had drawn 914,415 in 2018 through 37 dates, down 60,407 in total attendance and 1,633 average attendance per game, from 974,822 after 37 home dates for a team that was 27-55 through 37 home dates in 2017. What's more perplexing is the rash of empty seats come in the midst of the Phillies currently owning the best home record in the National League (30-16), and second-best home record in all of baseball (behind the Seattle Mariners' 30-15 home mark as of July 5). So, why is this happening? Well, it may not be as much a Phillies issue as it is a baseball issue. The numbers don't lie. Through the 4th of July holiday, 21 of the 30 major league teams had a negative attendance figure, in comparison to what they drew in 2017. And even that is somewhat deceiving, considering the Phillies (+825 on average) and the Tampa Bay Rays (+424) are less than 1,000 fans better than their average attendance per game last year. Both teams, it should be noted, received a considerable boost by visits from the Yankees. Prior to that, the Phillies and Rays were in the negative. As a whole, MLB, usually a big-ticket rush in the past, is down 2.24 MILLION in total attendance and down 1,736 fans per game compared to the same point last season. The current average attendance of 28,191 per game is an interesting figure as well. MLB has not dipped below an average of 30,000 fans per game since 2003. Perhaps that's why the Brewers, a first place team, were holding a 50-percent-off ticket sale for their series against the Braves, another first place team. For example, the Chicago Cubs and Boston Red Sox, two traditional gate winners with great, old ballparks, and the Cleveland Indians, a team that probably has a playoff berth clinched already in the horrid AL Central, are a combined minus-145,022 in attendance as of July 5, 2018. As for the Phillies, they’ve had attendance drops in five of their last six years, with the one anomaly being the attendance rise of 84,064 total (and 1,038 per game) in 2016 after the Phillies went 63-99 in 2015. Aside from an aging fan base, three factors could be contributing to why fans haven’t been showing up to Phillies games this season, and why MLB as a whole is seeing declining attendance across the board. Fans pay to see the ball in play, not batters whiffing at a record rate. Strikeouts are at an all-time high and the Phillies this season fall right into the mix. As of July 4, the Phils were fourth in Major League Baseball in team strikeouts through 84 games with 802 Ks — behind the Texas Rangers (820), Chicago White Sox (820) and San Diego Padres (818). Overall, strikeouts have hit the big leagues in epidemic rising proportions. In 2017, there was an all-time high in strikeouts and it looks as if MLB is heading in that direction again this season. According to Elias Sports Bureau, there were 6,656 strikeouts and 6,360 hits in April, making it the first month in MLB history in which there were more strikeouts than hits. The previous low differential, according to Elias, was in April 2017, when there were 138 more hits than strikeouts. The Phillies are certainly feeding that monster. As a team, they have 649 hits through 84 games and have struck out 802 times this season. In contrast, the 2008 World Series champion Phillies had 1,407 hits as a team and struck out 1,117 times. The defending World Series champion Houston Astros collected 1,581 hits and struck out a total of 1,087 times last season. Even when the Phillies were hideous, as they were in 2015 when they went 63-99, and finished a whopping 27 games out of first place, they still managed 1,374 hits against 1,274 strikeouts. As of July 5, MLB teams are averaging 721 hits per team against an average of 733 strikeouts. Last season, those averages were 1,407 hits per team against 1,337 strikeouts. In other words, this is shaping up to be the first season in MLB history in which there are more strikeouts than hits. *over 2,552 game as of July 3, 2018 with 2,308 games left to play. The Phillies’ single-season strikeout record is 1,155 in 2003. With 802 strikeouts through 84 games, they need just 354 more whiffs with 78 games left to set a new ignoble mark. Currently, they’re striking out an average of once every 3.9 at bats — and an average of 9.54 Ks a game, which is the most of any team of the majors (White Sox, 9.53; Rangers, 9.4; and Padres, 9.2). And, if they keep up that pace, they should break their strikeout record with about 40 games left to play this season. Strikeouts also tend to lengthen games, which could be another reason why attendance has slipped. Baseball games are too long — and getting longer. There was a time when you could go to a Phillies game and not have to worry about finding some grey in your hair by the time the final out was recorded. Now, it’s customary to sit through three hours or more. As of July 4, the Phillies were among the top seven teams that played the longest games, tied for fourth with the Chicago Cubs and New York Yankees. In fact, an MLB game today that ends in less than three hours is a rarity. Only three of the 30 teams (Oakland A’s, Los Angeles Angels and Seattle Mariners) in MLB finish their games in less than 180 minutes. In 2008, an average Phillies game lasted 2:55. In 2002, a game lasted an average of 3:01, the first time in Phils’ history that games lasted an average of over three hours. In 2014, games lasted an average of 3:09 per game, the longest in franchise history. Strikeouts can contribute to that — as can pitching changes, which Kapler definitely has a penchant for doing. It happens. It’s part of the course of a game. But it also makes the game slog forward at a nauseating pace. Some blame analytics for this. The Phillies have embraced deep counts, shifts, and Kapler has no problem using three or four relief pitchers during the course of a game. What’s strange about the length of Phillies’ games is that they’re last in Major League Baseball in at-bats (2,780 through 84 games) and 28th in MLB in total plate appearances (3,174). Through July 4, the Phillies are also putting the ball in play less than any team in the majors (2,028 times in 3,174 total plate appearances, which translates into 63.8-percent through 84 games, per Elias). The next closest teams are the Texas Rangers (64.2 pct. ), San Diego Padres (66 pct. ), Chicago White Sox (66 pct. ), and New York Mets (67 pct.). As of this week, those four teams were a combined 139-205 (.404) while the Phils somehow have managed to post a .560 winning percentage. You would figure with so few at-bats — and so little contact — the games would move quicker. Not so. The Phillies have a star problem. Ace pitcher Aaron Nola could change that, but not right now. Nola, though familiar with the more serious Phillies fans, does not have the same crossover appeal as someone like Cole Hamels did when he was the ace of the Phillies’ World Series-contending teams in the late-2000s. Hamels was everywhere locally and nationally after being selected 2008 World Series MVP. Presently, if there was a face of the Phillies it would be Kapler — and he’s still not that endearing to the crustier, old-school fans. Three Philadelphia-area marketing experts felt the same way. This Phillies’ team, though they are winning and are filled with high-character players (Nola, Rhys Hoskins, Carlos Santana, Scott Kingery, Zach Eflin, Andrew Knapp, Nick Williams, Maikel Franco and Aaron Altherr), has not been completely embraced by Phillies fans, they say. It’s a team that recently has been identified with losing more games the last three years than any Major League team, suffering three-straight 90-plus losing season (99, 91, 96) and finishing either last, or next to last, in the National League East over the last five years, going an average of 26 games out of first place each season—with their season done in June. That’s a lot to rinse off in one season of tepid success. It may explain why there are oceans of empty blue seats in the right field and left field corners at Citizens Bank Park, throughout areas of the outfield and all along the upper tier. It may explain why the fanbase still needs to be convinced these 2018 Phillies have sustainable power. It’s both a Phillies’ problem and a baseball problem. Obtaining a recognizable star like Manny Machado would cure what currently ails the Phillies. Though on a larger scale, with little consideration given to batting averages or the rising number of strikeouts and little contact today, what does Major League Baseball do?